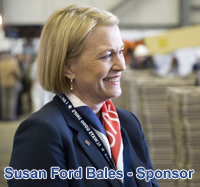 Susan Ford Bales is a Virginia native and now resides in Tulsa, Oklahoma. She is the daughter of President Gerald R. Ford and Betty Ford and is married to Vaden Bales, an attorney with the Riggs Abney firm in Tulsa. Select one of the videos listed on the right and Click the Share button to Share the video. The ceremonial landing of the island on the aircraft carrier Gerald R. Ford (CVN 78) is one of the largest super lifts in the ship’s construction. At the time of landing, the island will weigh 555 tons (493 tons of structure, 62 tons of equipment). The Ford island is 30 feet wide and 60 feet long at the flight deck base; the island rises 72 feet above flight deck and incorporates nine individual deck levels. The island is shorter in length, but stands 20 feet taller than the previous aircraft carriers’ islands.